Quick, let’s get this two-week-CSA update out… only just ahead of tomorrow’s pickup. There’s been a lot going on in this kitchen; we’ve been canning, pickling, and generally inhaling massive amounts of summer produce. I have learned that peeling peaches is actually quite easy, even if you don’t use the scoring-and-blanching method. (The kid loves peach, but refuses peach skins.) I have also chunked up what feels like a record number of watermelons. Two-year-olds inhale watermelons. Good for hydration, right? 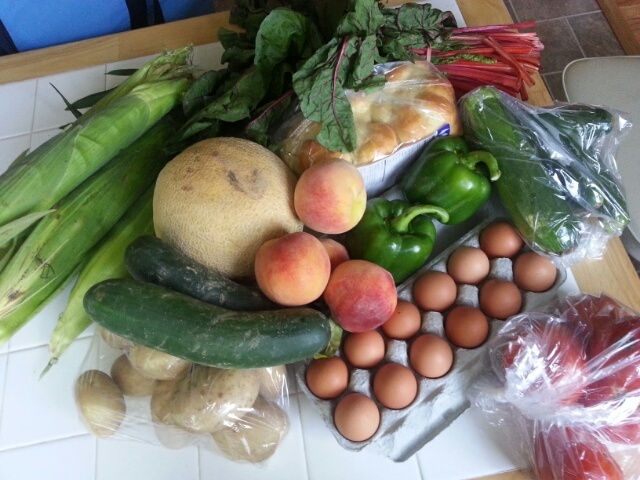 Anyway, last week on the CSA: corn, chard, cucumber, cantaloupe, white potatoes, peaches, green peppers, zucchini (I think I could have picked yellow squash, but I like zucchini much better), tomatoes, eggs, and bread (Great Harvest challah). The chard got creamed with some spring onions from the farmer’s market. Cucumber got refrigerator-pickled, along with last week’s cucumber. Zucchini was simply sliced, seasoned, and roasted; peppers joined tomatoes, last week’s eggplant, and some salsa for a tasty chicken dish. Corn is, weirdly, still intact in the fridge. 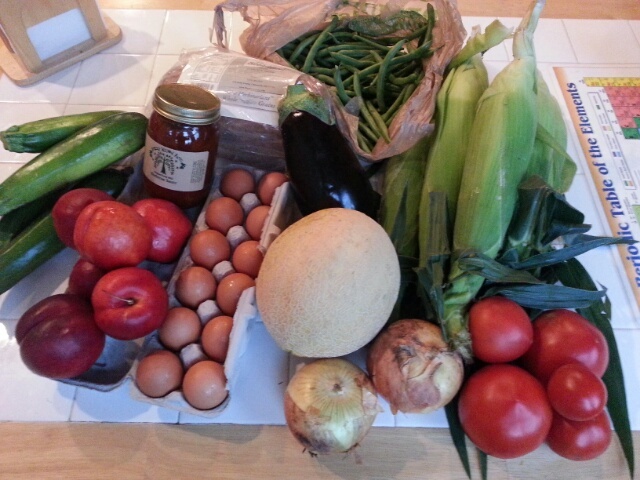 I’ll probably boil it up and snack on it tonight, before tomorrow’s pickup. Nectarines, cantaloupe, and tomatoes were eaten immediately; green beans were blanched, seasoned, and served up in lunches; corn was boiled and eaten up. Zucchini was sliced, seasoned, and simply roasted in the toaster oven. I don’t remember what specifically happened to the onions, but we use onions up all the time; they probably got diced into something and sauteed.